Sunday 15th February from 10 am to 4 pm. The Rotary Club of Brimbank Central is proud to help bring the richness of Sri Lankan culture to Queen Victoria Market by sponsoring Lankanfest on Sunday 15th February from 10 am to 4 pm. Dubbed the ‘Pearl of the Indian Ocean’, ‘The Paradise Island’ and ‘The Resplendent Island’, Sri Lanka has a rich culture and a written history spanning 2550 years. With eight UNESCO world heritage sites packed in a tiny island, Marco Polo described it as the finest island of its size in the world. Furthermore, Lonely Planet named Sri Lanka as the number one country to travel to in 2013. Sri Lanka has seduced travellers for centuries and it is emerging as one of the planet’s best-value destinations. We would like to share a unique Sri Lankan experience with you through food, music, dance and craft. You can treat your taste buds to the different Sri Lankan cuisines and spices from all the different ethnic groups of Sri Lanka. For the cooking enthusiasts there will be cookery demonstrations. Magic of Sri Lankan dance will come alive in a stunning onstage spectacle — designed, scripted and composed using the local Sri Lankan talent. Lankan Fest Promises to be an entertainment extravaganza that will explode your senses. The Market car park operates 7 days. Enter the car park from Franklin or Queen Streets.. The Market is within walking distance of Melbourne Central Station (Elizabeth Street exit, head north) and Flagstaff Station (north along William Street). The Melbourne Visitor Shuttle goes to the Market for $5! Get off at stop 8. There is free bike parking in and around the Market. Major bike lanes leading to the Market run along Royal Parade and Victoria Street. Lankan Fest 2015 organised with the support of the Rotary Club of Brimbank Central, is the joyful celebration of the rich culture and heritage of Sri Lanka brought into the heart of Australia’s most liveable city. To be held on Sunday 15 February 2015 it will be the first festival of its kind in Melbourne, a city with a large and well established population of Ceylonese/Sri Lankan origin. In addition to the many stalls selling typical Sri Lankan foods that have become so popular in Melbourne, there will be an onstage spectacle of stunning Sri Lankan dance and a stall with a difference. 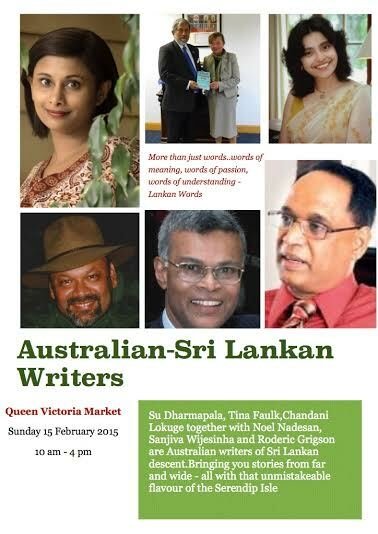 Six well known Australian authors – all of whom trace their ancestry and background to Sri Lanka – will be present at the Festival for you to meet. You can chat to them about their books and what inspired their writing – and purchase autographed copies of their books at specially discounted prices.